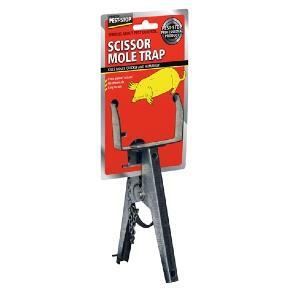 The Mole Scissor Claw Traps is traditional alternative to chemical or toxic solutions. Highly effective, this Mole Scissor Claw Trap benefits from features that make it superior to other similar-looking pincer-type devices. The Mole Scissor Claw Trap is easy to set, with long handles that ensure a safe grip while the loose plate is positioned in the centre of the clasp. After The Mole Scissor Claw Trap has been set in the mole run, the extra-powerful spring closes the trap on the mole when it dislodges the loose plate. From above ground, the open handles make it obvious that there is a dead mole to be removed. This Mole Scissor Claw Trap is manufactured from long-lasting plated steel.